Peter Parker again hosted the VK3 radio amateurs. This time the event fell on VHF/UHF Field Day weekend. So Peter and his friends went up in frequency and up into SPACE! Be sure to read about Peter's ankle manacles -- he apparently uses them to get a good ground (sea) plane while running pedestrian mobile on the sea shore. Peter is DEDICATED! I heard some guys talking about this on 40 SSB last night. A very cool use of the bidirectional pattern of the W8JK beam. 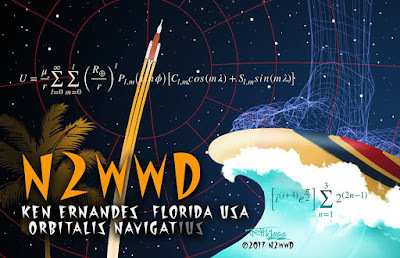 Round-the-world paths The bi-directional nature of this antenna makes it possible to discover open round-the-world paths, something not possible with a normal beam antenna. The technique used by Kraus is to rotate the beam slowly, sending short Morse code dots, with a full-break-in or QSK transceiver . The delay time for the signal to return is about one seventh of a second, so there is plenty of time for your transceiver to switch to receive mode. When you have found and peaked an open round-the-world path, call CQ, and you may be rewarded with DX anywhere along the path. Also, the question of Long-path and Short-path does not arise – you are transmitting on both paths at once, giving you a greater chance of catching the other station’s beam direction…. These are just a couple of short videos that I made for my nephew before sending him this receiver. As you can hear, deafness is not a problem with this design! I did make some frequency stability improvements after this video was made -- I think you can hear a bit of drift. Still, not bad for a very simple circuit using a polyvaricon superglued to the back of a cardboard box. I'll post more videos of the second version of this receiver. There are further improvements in frequency stability. My goal: "Juliano Si5351" levels of stable-ness. When I built the first prototype of the iPhone DC receiver, I just reached into my junk box and used a polyvaricon capacitor for the main tuning control. It was marked PL 051. I was really pleasantly suprised at the stability of the Variable Ceramic Oscillator circuit. I could tune the entire 40 meter band with complete stability -- Juliano levels of stability. By the time I put the second version into its box (see above), I used a different polyvaricon (the one pictured below). It worked, but with this part the receiver drifted noticeably. So this morning I pulled it out and put in a second PL 051 Polyvaricon. Viola! Eccolo! Success. Drift eliminated. Rock stable. Has anyone else noticed variations like this in the stabilty of polyvaricons? The dial in this version is an Archer device that has been kicking around in my junkbox for more than 20 years. I think it was given to me by my old friend Pericles HI8P -- this adds a tremendous amount of soul to this new machine). The box is an old Bud aluminum chassis. Man, this thing sounds great. I will try to post a video soon. I went with simplicity. Extreme simplicity. Direct Conversion (thanks Wes!). Discrete components. No chips. Analog Oscillator. 40 meters -- monoband. -- Single tuned circuit bandpass filter preceded by a simple pot that serves as a gain control. 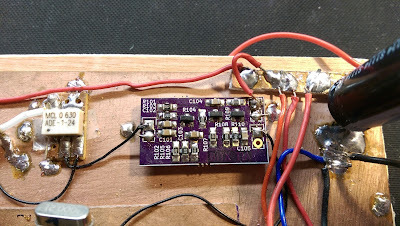 -- Singly balanced passive mixer inspired by F5LVG's RX-20 in SPRAT 100. For the coil I used one of the many trifilar toroids that Farhan gave me. -- The local oscillator is the coolest stage. I used a 7.37 MHz ceramic resonator and a circuit inspired by Miguel PY2OHH. With a polivaricon I can tune the entire 40 meter band. I put a reduction drive int here to make tuning easier. -- The AF amp is an op-amp free design. It works well into ear buds or into a computer speaker. -- Perhaps in an effort to catch the attention of the younger generation, I built it into an iPhone box. Please let me know if you spot any flaws in the circuit, or see any places where it might be improved. More to follow. This prototype is now in the mail, en route to my nephew John Henry who will be testing it for me. 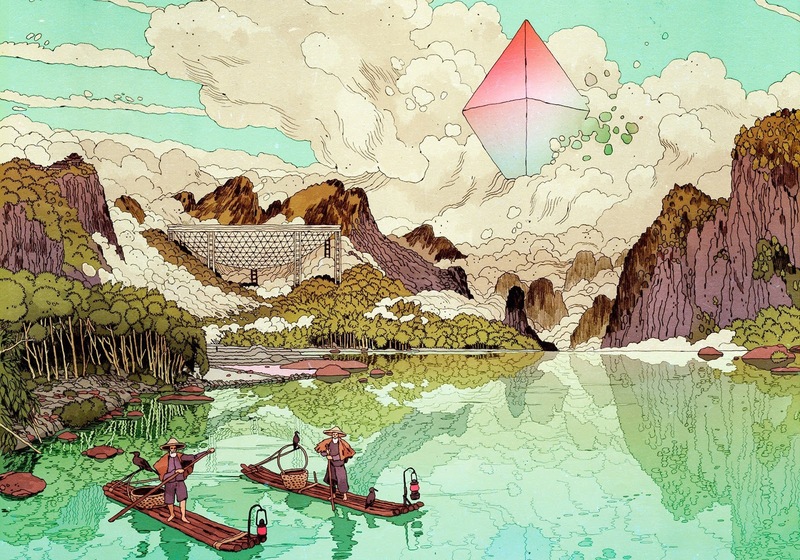 China and SETI: What Happens if China Makes First Contact? Here is a really amazing article from The Atlantic. It is very thought provoking. Mind blowing. Strongly recommended. Thanks to Mike Rainey AA1TJ for alerting us to this. I've talked to this guy several times. He usually waits until I'm testing a new rig. I'm sure Pete has worked him too. Amazing Homebrew/Boatanchors QSOs on 40 --Six solder melters in a row! After a day of happy tinkering with the Direct Conversion receiver I've been working on, I turned off the soldering iron and got on 40 meter SSB with my BITX Digi-Tia. First -- Steve W4IJ came back to my CQ. Steve is a boatanchor enthusiast and has written for Electric Radio magazine. FB. When Steve signed off, I got into a contact with Pete W8NBO. 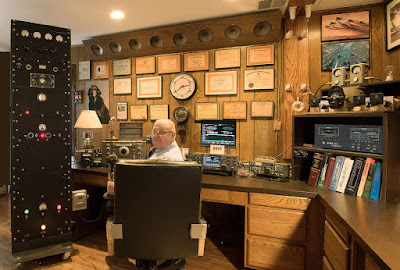 We had spoken before and he had told me of a homebrew transmitter he'd built as a kid. This time I asked for details: It was a 6AG7 oscillator to a 6L6 amplifier. He ran it with an S38 (brave man!). He described what must have been a very painful effort to hack (literally) the needed holes in the transmitter chassis using just a spike, a hammer and a file. I told him this brought back my memories of similarly painful chassis work (mine was for a power supply for a Heath HW-32A). At this point we were joined by Arnie, W2HDI. Arnie's rig is in Stowe Vermont, but he was running it remote from the South of France where he and his wife were celebrating their 50th wedding anniversary. Arnie shared with us memories of similar chassis pain -- his were related to an external modulator that he built for a DX-40. I think he said that all he had was a hole punch and a file. Oh, the humanity! This was almost too much. Rarely will you spontaneously come across so many hams who have melted so much solder. FB. Icing on the cake: When I returned to the bench, I fired up the DC receiver and heard Mike KN4EAR talking about his BITX40. I switched to the Digi-Tia and gave Mike a call. He reports making many contacts with his rig. FB. Here's a reminder of the amazing art work of Jeff Murray K1NSS. Well, I got as far as high school intermediate algebra and then I saw a squirrel. Thank goodness others like Ken N2WWD were paying attention and went on to surf gravity's rainbow of flight dynamics, all in a day's work and play for rocket scientists. Tandem surfing and professional activities somewhat aside, Ken is also actively involved with ARISS, i.e. Amateur Radio on the International Space Station, the group guiding ham radio operations aboard ISS. So Kelvin cool to work with Ken on this New One, with Ken cooking up a special Easter Egg for all you galactic hitchhikers! Here are the eagle file data for the TIA, that I love to use as incorporated in Farhan's ubitx. The TIA , I tried to realise two such on a double sided pcb measuring less than an inch. It mounts one TIA on each side. I suppose one could simply homebrew. It has provision for 5 pin berg (male right angle) and would be easy to plug into the main board. We may not need PTH except the connector. We can use bare pins soldering on either side. Here are the eagle files I created. Hack-A-Day had an excellent piece on tubes and Silicon Valley this week. Makes me want to get the book "Secret History of Silicon Valley." 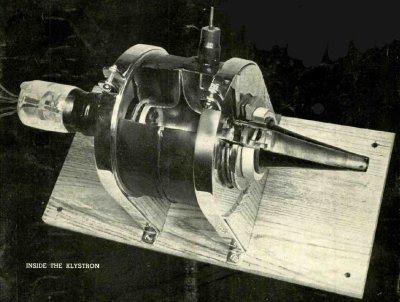 Note above the Klystron prototype mounted on a wooden board. These guys clearly had THE KNACK. Thanks for sharing (the infor on the modular BITX boards). I actually had a similar idea a number of years ago and designed a small PCB for the ubiquitous BITX amplifier design. I have the project shared on OSH Park and you can get three of them shipped for $5. The project is shared here.